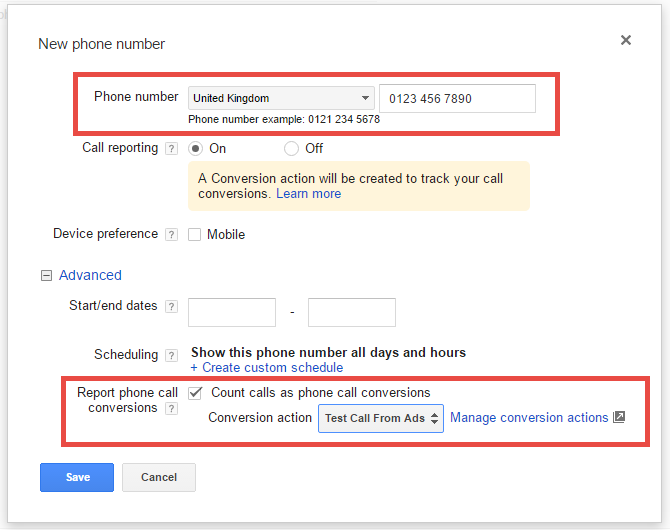 The very first thing we do when auditing a new Adwords account is check conversion tracking is set up correctly. Conversion actions are missing. For example, contact form leads are tracked but phone calls aren't. The same visitor is counted as a conversion multiple times. Google Analytics micro-conversion goals like time on site, page visits etc are included as a conversion. This leads to poor bidding decisions based on misleading data. This guide to Google Adwords Conversion Tracking for Lead Generation will show how to avoid these costly errors and much more besides. We'll start by looking at the conversion types you should use for lead generation and why accurate conversion tracking is critical to success with Adwords. Or any other marketing channel for that matter. 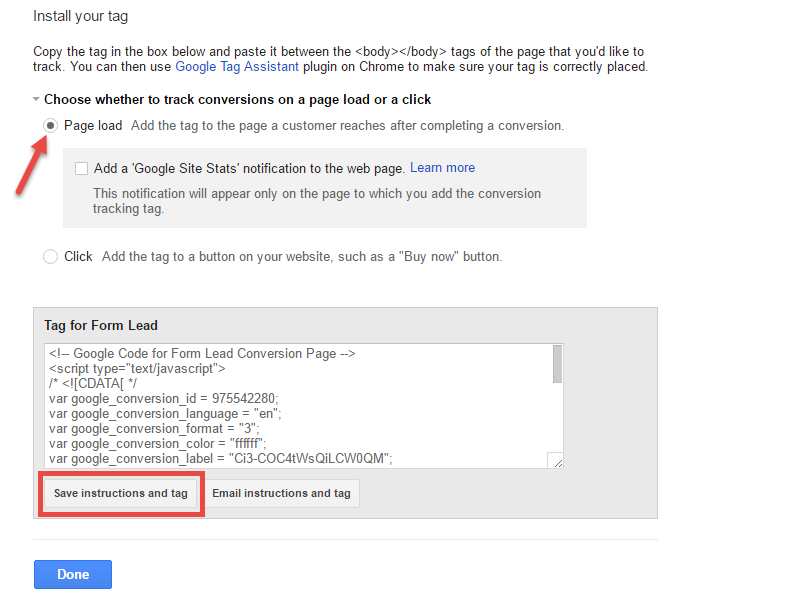 Finally, we'll show step-by-step how to set up AdWords conversion tracking for each of the three common conversion actions used for lead generation. 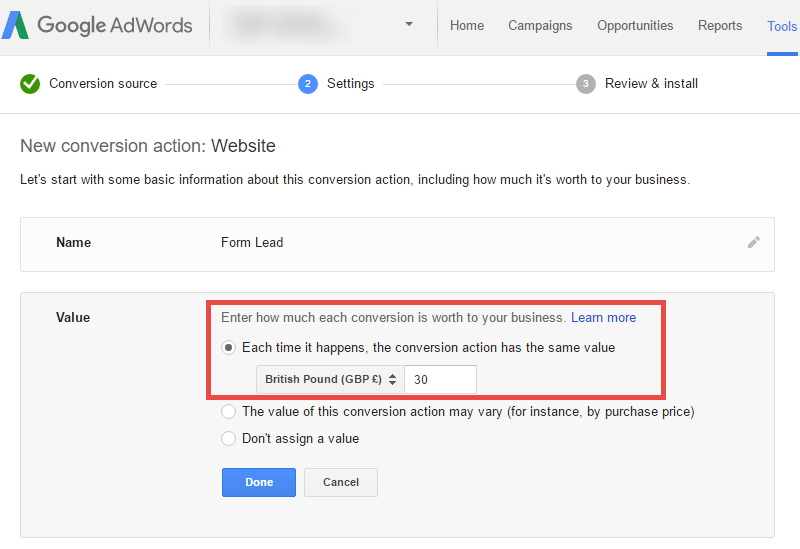 So Why Track Conversions In Adwords? Simply put, it's impossible to improve what you don't measure. Profitable lead generation is all about knowing your numbers. Conversion tracking provides the data to make informed decisions on where to target your spend for the best ROI. Better yet, by passing Adwords data into your CRM of choice, it's possible to track all the way through to the sale and target those campaigns, ads and keywords generating revenue, not just leads. For financial service businesses, optimised ppc marketing based on sales data can be a real game-changer and significantly improve your ROI. It's impossible to improve what you don't measure. Online forms. For example, to get a quote, make a general inquiry, request a callback, download a whitepaper, or sign up for a free trial. Phone calls. This could be a mobile call directly from the ad itself, or a call made by dialling the phone number listed on your website. Let's start with form leads first. In your Adwords account, click on Tools -> Conversions. Then click the red +CONVERSION button. and you'll see a choice of conversion options. Select the Website option. Name your conversion action and assign an average value for each form submission. Even if it's only an approximate value for now. However, if you know your average order value or lifetime customer value, dividing it by the number of form leads typically required to generate the client or user will give you a good idea of the value to enter. Next up, select One as the Count so that Adwords only counts one conversion if a visitor fills out the same form twice during the conversion window. By default the conversion window period is 30 days but can be customised (on the same screen) to suit your business model up to a maximum of 90 days. For lead gen, always select 'One' for every conversion action you set up. The 'Every' setting is more commonly used in e-commerce where a visitor might make multiple purchases during the conversion window, and you want to record each transaction and value. As an aside, we previously used to count lead volumes and make bidding decisions based off the Converted Clicks metric. However Google started phasing out Converted Clicks in September 2016. As a click metric, Converted clicks counted how many individual clicks generated one or more conversion actions. Which, for lead gen accounts was slightly more accurate in many cases than the Conversions metric. Here's an example to illustrate why. Let's take two hypothetical visitors, Visitor A (Emma) and Visitor B (Stuart). Emma does a search on her mobile phone and calls your business by clicking your ad's click to call button. Later the same day (or at any point in the next 30 days of your conversion window) Emma does a second search, clicks your ad again and makes another call. Stuart clicks your search ad and fills out your online quote form. Later that day (or at any point within your 30-day conversion window) he searches again and this time clicks on your organic search result. 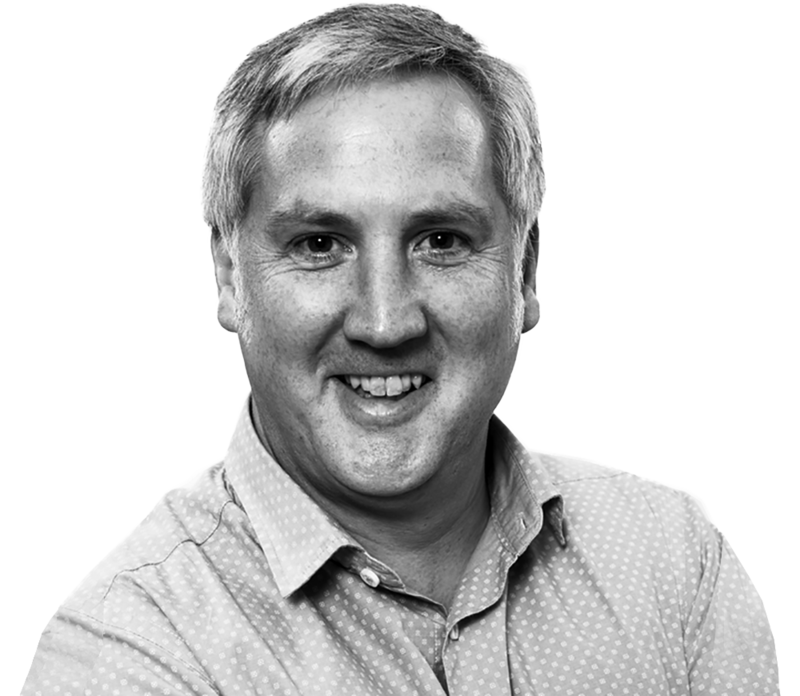 When he lands on your website, Stuart calls the Google forwarding number generated from the initial Adwords click. So why 2 Conversions? Stuart performed two different conversion actions - an online quote form and a website call conversion. The Conversions metric counts one of each conversion action (if the One Count setting is used) whereas Converted Clicks counts the single ad click that led to the multiple conversion actions over time. On a related note, did you notice how Adwords still claims credit for the conversion, even though only the original click was from Adwords? Regardless, the key point to remember is that if you use more than one conversion action on your site, the Conversion metric may slightly overstate the number of unique leads. Set the Category dropdown to Lead. Next, we need to check the Include in "Conversions" option, so Adwords reports it in the Conversions column. It also means we can use the data for portfolio bidding strategies like Target CPA, and Enhanced CPC. By default, Google will have the Page Load radio button pre-selected, which is what we want. Copy the tag or conversion tracking code to the clipboard. Then paste it in the html of the thank you page visitors reach after submitting the form. It can go anywhere in the <body> section, but ideally just before the closing </body> tag. Makes sure the tracking code is only placed on the thanks page, or you'll get lots of false conversions reported. As you only want visitors who complete your form to visit the thanks page, add this meta code snippet to the <head> section to prevent the page from being indexed and appearing in search results. Rather than manually adding the tag to the thanks page, consider using Google Tag Manager instead. Once the GTM container code is in place, it's super easy to add any code snippet to your site (Google analytics, conversion tracking, 3rd party call tracking, etc) without having to wait for your web developer. A huge time saver! We'll look at GTM in more detail in Part Two. Ok, so that's web form leads covered. Now you can see how well each form type performs in converting visitors to leads. Now let's move on to phone call conversion tracking. There are two main types of call conversion. Website call conversions occur after the visitor comes to your site. Both Calls from Ads and Website Call Conversions use Google forwarding numbers to report calls. Google currently provide forwarding numbers, free of charge in 19 countries, including the USA, UK, and Australia. Each forwarding number (which can be a local or freephone number) is unique to the visitor for the entire conversion window, as long as the user doesn't delete their cookies. How Do Google Forwarding Numbers Work? 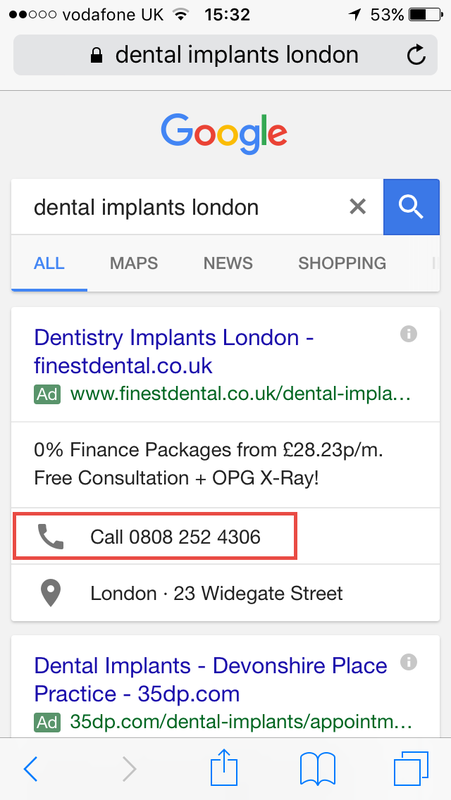 Google displays your business telephone number in the ad call extension (or as the headline if you are using Call-only ads), like the example above. When a searcher clicks the call extension, Google displays their forwarding number on the Call / Cancel dialog that pops up. Google will still charge you even if the user clicks Cancel at this point. After the searcher clicks the Call button, Google redirects the user from the forwarding number to your business tel number. The searcher clicks an ad and gets taken to your landing page. Google then dynamically swaps out your business phone number and replaces it with their forwarding number. The visitor dials the forwarding number, or on a mobile device, taps the click to call button or phone number link and gets redirected to your business telephone number. Hit Tools -> Conversions and click the red + Conversion button again. As you can see, it's very similar to how we set up the form lead earlier. The default options provided by Google are a good starting point. Just be sure to set a conversion value and the minimum call length you want for the call to be registered as a conversion. Click Save and Continue. Now we just need to set up our call extension. On the next screen click Go to call extensions. Click the red + EXTENSION button, and choose the campaign(s) you want to apply the call extension to. Now we need to add a business phone number by clicking the + New phone number button. Select your country and enter your business phone number. 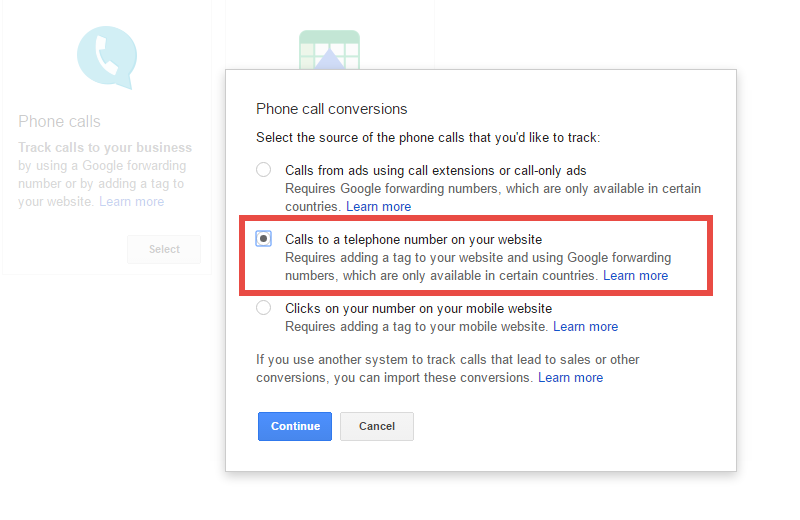 By default, Google will set the call reporting option to On. Perfect. Now Google will automatically use a Google Forwarding Number to track your calls. Ignore the message about the conversion action. 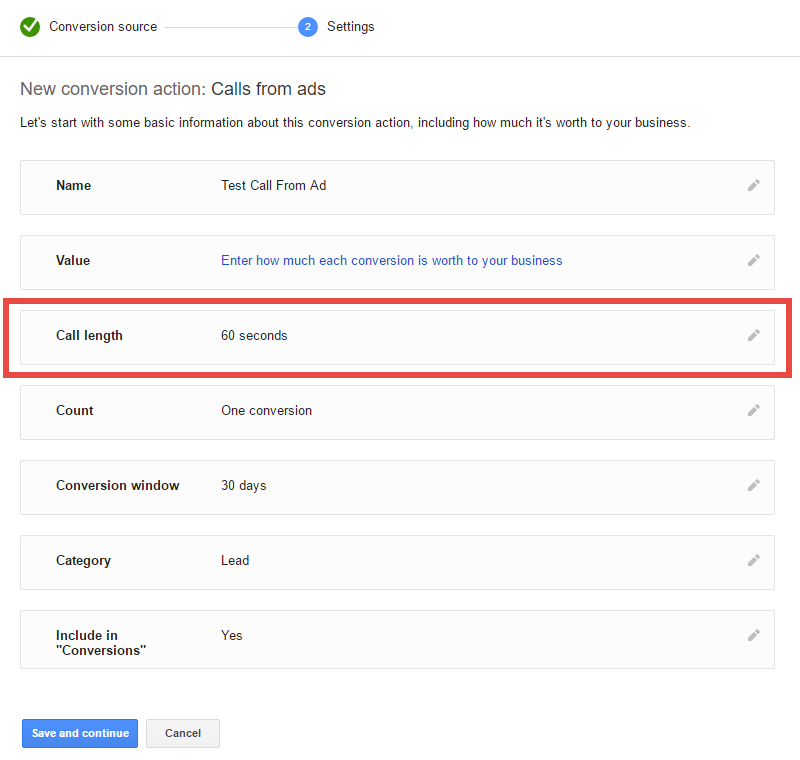 By default, Google will create a Call from Ads action if you want call reporting. But to quickly identify the conversion, I recommend you create, and custom name your own as we did previously. Just select it from the Conversion action dropdown at the bottom of the screen. Make sure Count calls as phone call conversions is ticked. Click Save and Save again on the following screen, and you're all done. Website calls are slightly trickier to track but have recently got far simpler thanks to some improvements Google have made. 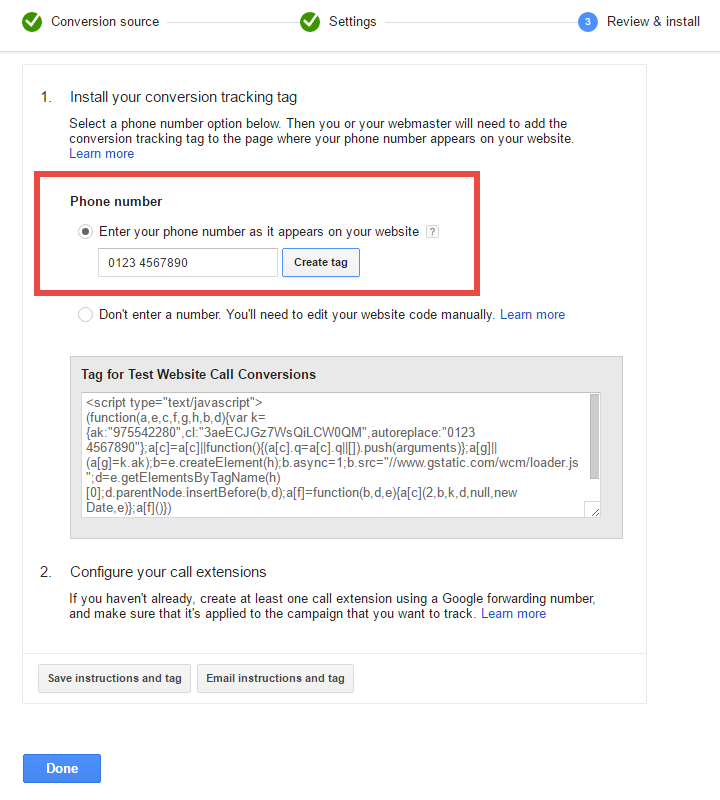 Again, in Tools->Conversions, select Phone call as your conversion source. But this time choose the Calls to a telephone number on your website option. Notice the two radio buttons here. The bottom radio button is the legacy, more complex tracking method. Ignore this and select the top Enter your phone number as it appears on your website option. Now just enter your business phone number exactly as it appears on your website (including any spaces) and click the Create Tag button. Next, grab your newly generated tracking code from the grey box beneath the second radio button. Take a close look, and you'll notice Google has automatically inserted your tel number inside it, so that it can be dynamically replaced with a forwarding number. Ok, now just copy the tag inside the grey box and place it in the <head> section of any website page that contains your tel number. If that's most or even just a few pages, setting it to appear on all pages is fine. The final step is to create your Google Forwarding number. However, if you've already created one for Calls from Ads, as we did above, you can just use that. There's no need to create a second forwarding number, unless you want to redirect website calls to a different office number. That's it, you've successfully set up website call conversions. Look out for Part 2 of The Essential Guide To Tracking Lead Conversions In Google Adwords, where we'll delve into advanced conversion tracking topics like tracking offline conversions, 3rd party call tracking and importing Google Analytics goals into your Adwords account. In the meantime, let me know if you have any questions about conversion tracking in the comments section below.